One of my favorite shoes I created last year was a pair of tropical flat sandals for Elizabeth, another friend and coworker at Converse. It never fails that each morning when I finally make it to work and slump into my chair, feeling rushed and disheveled, Elizabeth is already there at her desk looking perfectly put together. Her long blonde hair is interestingly styled, she’s almost always wearing lipstick and she doesn’t even use a chair, opting to stand at an elevated desk like a graceful statue. Her fashion style is equally on point, mixing neutral clean-cut basics with trend-right statements – like a fun palm print romper! 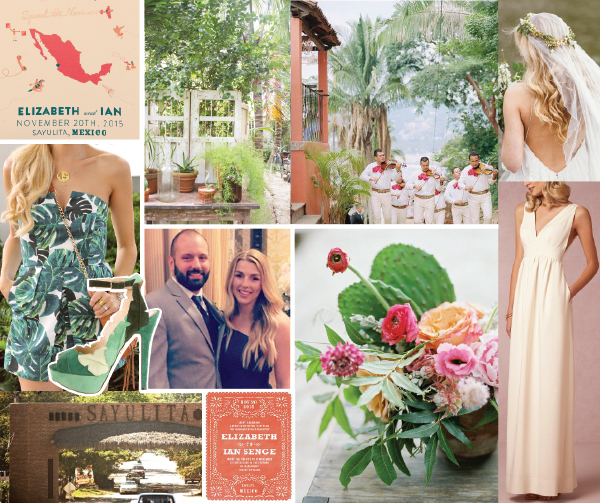 It didn’t surprise me when I found out she was planning a destination wedding in Mexico, designed around a tastefully tropical color palette of terracotta and greens with an effortless relaxed vibe. With all of this inspiring imagery to work with, the shoes came together like a breeze. 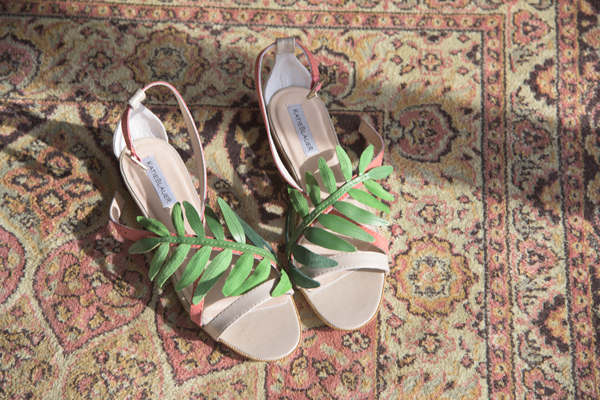 Unlike most sandals you would find at a store that might feature one – maybe two – colors, I was able to take the opportunity of designing a shoe from scratch to incorporate all of the elements in Elizabeth’s color palette. 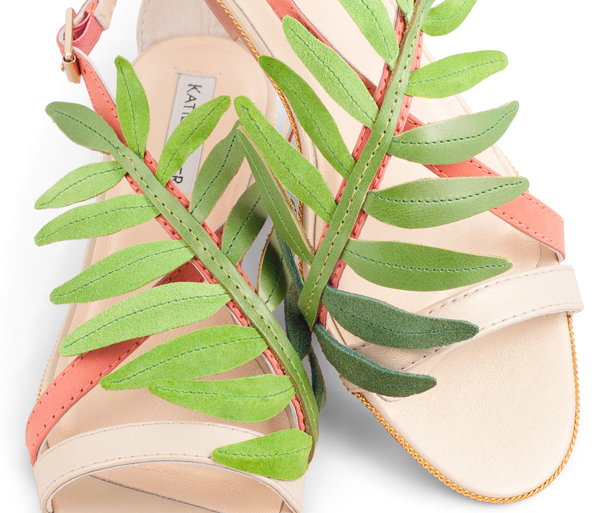 The single coral colored strap (in nubuck leather, to capture a true matte terracotta finish) and the variegated tones of the green palm leaves (which give the effect of dappled light) are grounded by pearlized champagne lambskin in order to coordinate with her ivory dress and kept the sandals feeling bridal. I reinforced each leaf with a lightweight anodized green copper wire to ensure it wouldn’t wilt and edged the outsole with a micro gold chain to keep the style from looking too casual. 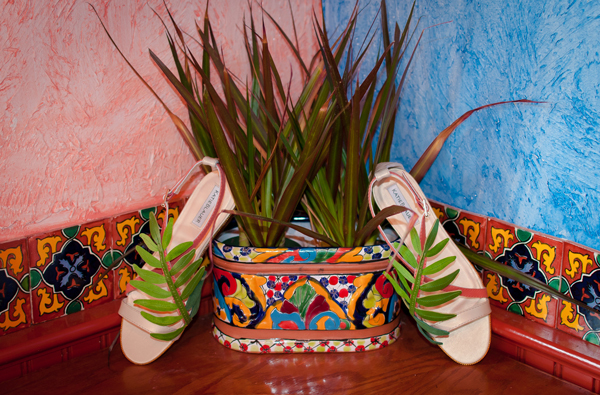 To showcase the finished product, we took a cue from the success of our Five Guys photo shoot with Allison’s hamburger shoes and brought Elizabeth’s palm sandals to a nearby Mexican restaurant, Margaritas. 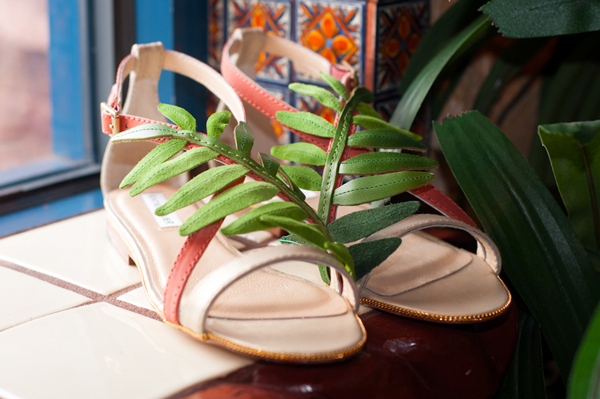 There, we were able to shoot the shoes against backdrops of Mexican tile and tropical plants – with very fun and vibrant results. While I know it was tempting to just go barefoot the entire time while at their beach resort in Mexico, I’m thankful that Elizabeth was as equally pleased with the results of her custom wedding shoes and was happy to hear they were a unique detail that helped make the day truly unforgettable. 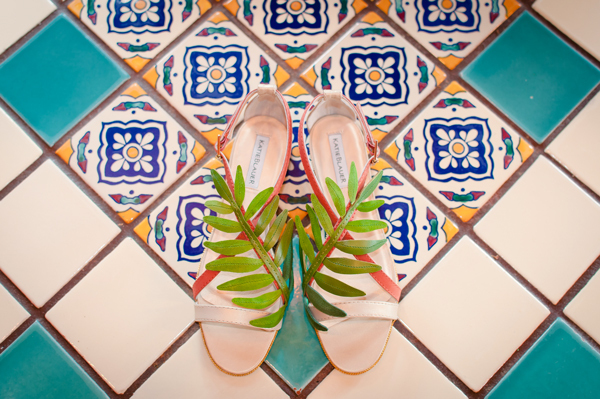 View more of Elizabeth’s wedding and her tropical wedding sandals here in our Gallery! This entry was posted in gallery preview, inspiration, photography, shoes, travels. Bookmark the permalink.